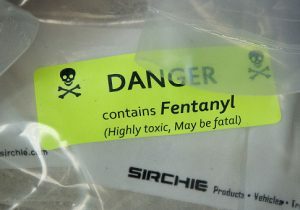 Four Chinese nationals face charges, and another five face economic sanctions, related to a multistate fentanyl trafficking conspiracy that claimed at least four American lives, Attorney General Jeff Sessions announced Friday. Federal work in busting the drug trafficking network has been years in the making, beginning with the January 2015 overdose death of a Grand Forks, N.D. teenager. Tracing the source of fentanyl that led to that tragic death uncovered a conspiracy dealing drugs in 11 states, from Oregon to Florida, over the course of five years. All of those drugs were coming from mainland China, a major source of deadly fentanyl in American drug markets. At the head of the conspiracy was Jian Zhang, a Chinese national and the owner of Zaron Bio-Tech (Asia) Ltd. Jian, the Treasury and Justice Departments allege, used his company and its factories across southeast Asia to produce fentanyl and smuggle it to the United States. Jian Zhang was previously indicted by the Justice Department as part of the first ever indictment of Chinese nationals for fentanyl trafficking in the United States. On Friday, Jian, along with four of his co-conspirators and his business, was slapped with a further sanction in the form of designation as a "Significant Foreign Narcotics Trafficker" by the Department of the Treasury. Designation means that all of Jian Zhang and his business's assets in the United States are blocked and reported to the Treasury's Office of Foreign Assets Control. Transactions involving their property will also be blocked to the best of Treasury’s ability. "Combating the flow of fentanyl into the United States is a top priority of this administration. Today, Treasury is targeting Jian Zhang's fentanyl trafficking network, which has directly contributed to American deaths related to the opioid crisis," said Sigal Mandelker, undersecretary for terrorism and financial intelligence. "This action will disrupt the flow of fentanyl and other synthetic opioids into the United States, and serves as a warning that Treasury will continue to target the assets of those who deal in illicit opioids and synthetic narcotics." According to the Treasury Department's announcement, Jian Zhang's criminal enterprise distributed hundreds of packages of fentanyl and fentanyl analogues to the United States. Much of the fentanyl flooding the United States from China is sent through the U.S. mail, a fact highlighted by a recent Senate report. Jian's network also relied on a dedicated network of encrypted communications, offshore accounts, and international money-laundering operations. Both the Treasury and Justice Departments lauded the Chinese government for its law enforcement cooperation. The Treasury Department noted China has domestically controlled 143 fentanyl analogues and other synthetic drugs over the past two years. That includes the highly deadly elephant-tranquilizing opioid carfentanil. Sessions offered qualified praise for Chinese involvement, emphasizing that he still believed there was more they could be doing to help curb the flow of deadly drugs into the United States, especially better cooperation on the sharing of bank records. "I appreciate that the Chinese government has provided assistance to our law enforcement efforts on this case," Sessions said. "We strive for a high level of cooperation. I hope that cooperation will grow in the future. The fact is that we must have more help, and as trading partners, we have a right to expect it."